If you have been considering making a ukulele, but have been put off by the lack of access to the specialist materials usually needed, then perhaps the experience gained in my own 'scrap box' construction will be of some use to you. 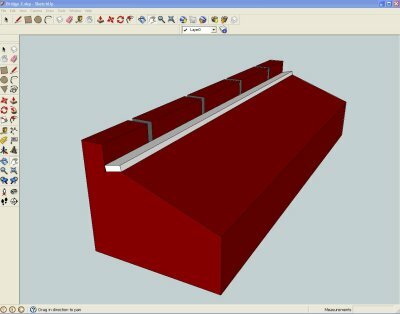 Also of interest may be my use of the free Google SketchUp program, that I found invaluable in the initial design stage, and an Excel spreadsheet I created for calculating the fret spacing for any required scale length. - describes the modification of the chosen cigar box. - gives details of scale length choice and headstock shape. 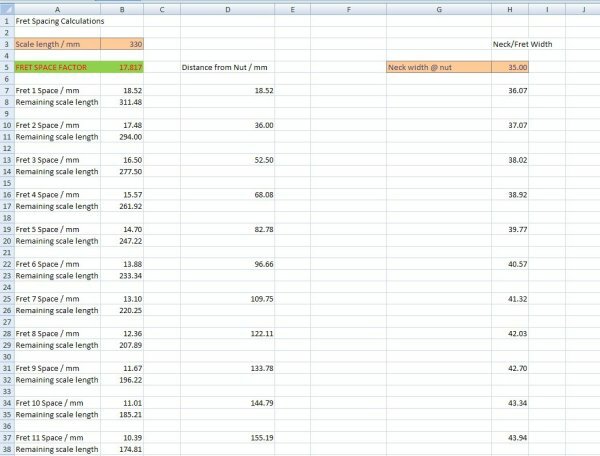 - explains fretting method with calculations and down-loadable spreadsheet. - details modification of standard brass hinge. 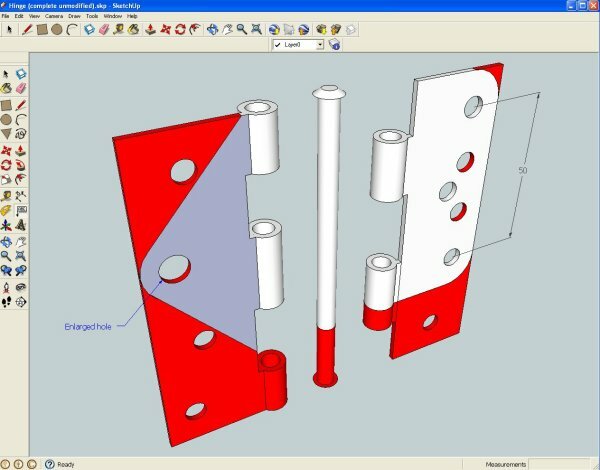 - outlines the design decisions (and modifications) of these parts. - illustrates a simple way to achieve amplification of the instrument. Just click on one of the titles to be taken directly to the section of particular interest. At the bottom of the page you will also find a Contact section that you can use to ask any questions that you may have, as well as a list of Links to other useful websites that may provide further information. The cigar box that I selected for making the ukulele body measured 260 x 130 x 42mm and had a nice assortment of labels which I thought I could incorporate. The box lid was permanently hinged to its base, so all modifications were made with the two halves joined. The first thing I did was to remove the lightly-glued in strips from inside the base, which acted as lid locators, and to apply a good fillet of wood adhesive to reinforce all the corner joints. If it wasn't for the labels, I would have inverted the box and used the thinner material of the base as the soundboard. As it was, I put looks above resonance quality. 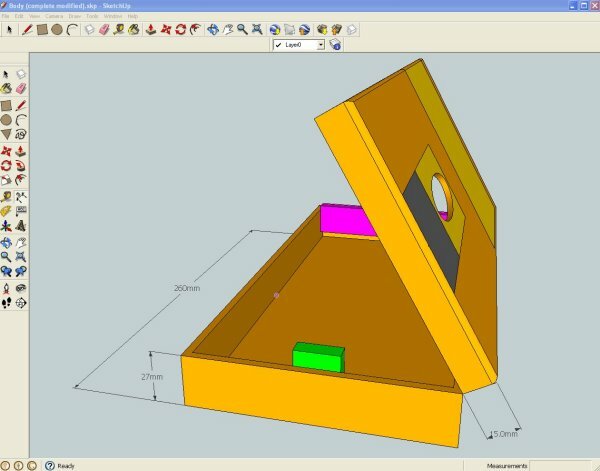 Using the thicker lid material (>3mm), though, did mean that bracing strips wouldn't be necessary. 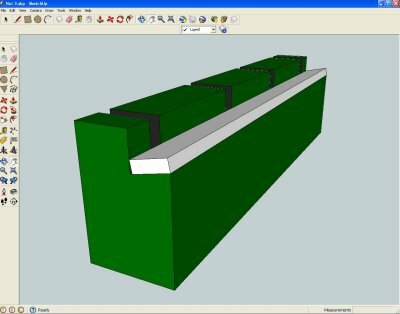 The SketchUp screenshot below, however, shows the strengthening pieces I added to each end of the box; the small 'green' piece for the neck heel screw and the longer 'mauve' piece for the tailpiece attachment. If you're puzzled about why I cut an elliptical sound hole, rather than a usual circular one, then it was because the label at that end of the lid had a logo of that shape (the border of which is still just visible in the main pic). I'm sure that the sound waves don't mind being squashed a bit as they come out! After gluing the two halves of the cigar box together, the only thing left to do was to give all the outside surfaces a couple of coats of light clear varnish. The size of the cigar box used meant that the resulting ululele would be a soprano type, therefore the scale length would need to be around 330mm. Choosing to join the neck to the body at the 14th fret therefore gave me an approximate idea of the neck length. From my collection of hardwood scraps, I found that I had a 19mm (3/4") thick piece of oak that measured about 350 x 100mm. But, as the machine heads I had were meant to be installed in a 12mm thick headpiece, I would have to locally remove 7mm of material from the top surface to accomodate them. However, before doing this, I decided to do a bit of design work regarding the positioning of the machine heads in the headpiece, as I had never been happy with the usual symmetrical arrangment that resulted in bending of the strings around the top nut. Then, based on my chosen nut string spacing of 10mm, I played about with the positions of the four machine heads until I achieved a straight-line run of the strings over the nut to the machine head spindles. With these positions established, it was then only a question of coming up with a pleasing shape to encompass them ......... which I hope I have achieved (see the attached pics). Once the headpiece design was sorted out, I started to cut out the neck profile, having made a cardboard template from my computer model. To make the heel of the neck, I simply glued on 2-small blocks from the offcuts of the 19mm material to be shaped to suit. As there's quite a bit to say about the fretting of the neck, I've put it into the following separate section. When deciding what type of material to use for the frets (in the true spirit of 'make do with what you've got', there was never any intention of purchasing proper fret wire), I had several possible options in mind, before happening on an old set of windscreen wiper blades. Using the template I made to cut out the neck shape, I marked out the fret positions onto it and then transferred these positions (with the help of a sharp nail point) onto the fretboard face of the neck. The more difficult part left was to cut the fret slots in the neck to an exact and equal depth. To do that, I used a couple of spacing blocks, one each side of the neck, topped with a large steel washer. With these in place I could saw each slot, knowing I had got to the right depth when I 'kissed' the washers on each side. The windscreen wiper material was then cut to length one at a time, starting with the widest one (in case it was cut a little too short, it could then still be used for a fret higher up the neck) and then lightly hammered into the fret slot. Again using a couple of metal washers of the required thickness to ensure that they were not over-seated. By using a standard paper hole punch, a nice set of 6mm dia sharp-edged discs were obtained which were then glued into equivalent size flat-bottomed drilled recesses in the neck. The tailpiece was made (as you can no doubt guess) from a spare door hinge. Rummaging through my box of assorted hinges, collected over the years, I found a 4" brass-plated one that I thought would be a possible candidate for the job. Each leaf of the hinge had 4-holes, in 2-staggered rows, and the pitch of each pair was 50mm, close enough to form the outside string anchor holes. You will notice that the V-shape of the attachment leaf of the hinge was dictated by the need to eliminate the original holes on each side of the required anchor screw hole, which was enlarged to suit the diameter of the plastic sleeve that was to be its pivot. Note: It was necessary to remove the hinge pin (by filing off the head) before re-shaping the individual leaves. 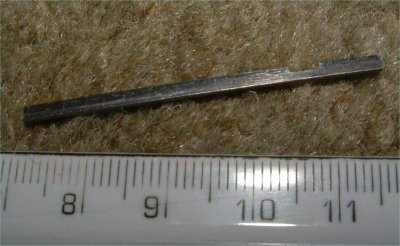 Later cutting the pin about 2mm longer than the reassembled hinge, to allow for re-peening over. To prevent the edges of the string anchor holes from cutting into the nylon strings, I also glued in some shortened plastic rawlplugs, to act as sleeves. The approach taken for making the bridge and the nut were identical, in that they were made from the same hardwood (oak) as the neck and used the same wiper blade steel strip, as the frets, as the string contact surface. The advantage of this 2-part method was that it simplified the string height adjustment process, as the string location slots could be cut over-deep, beyond the height of the contact strip, and the height of the whole block (nut or bridge) trimmed to suit. Initially, I cut the ledge where the steel strip was seated parallel to the base, but when I strung up the ukulele I experienced intonation problems as well as string buzzing. It took me a while to realise that both these faults were a result of the slight incline of the strings, from the nut to the bridge, which meant that the strings were not contacting either horizontal strip at one definite point. The cure was to file the ledge with a slight backward angle, which gave a single clean exit point for the strings. Just out of curiosity I thought I would see if my ukulele could be electrified, with the output fed into a guitar amplifier that I had at home. Thinking that a microphone is only a loudspeaker in reverse, I first clipped a pair of Walkman headphones over an unstrung section of the body and was very surprised by the quality and volume of the output. The problem then was what to use as a permanent fitting. It must have been the telephone ringing that gave me the 'light bulb' moment of using a speaker out of an answerphone. I was lucky in being able to raid the grandchildrens' playbox and retrieve an old phone that they had been using as a toy for several years. After undoing the various screws in the base of the phone, the innards were exposed showing a 50mm dia speaker that was soon removed from the case with a bit of screwdriver levering and cutting the attached wires where they joined the circuit board. As a test, after connecting a guitar lead to the speaker wires, I placed the speaker onto the soundboard of the ukulele and noted a vastly improved output over that with the headphones. What remained now was to trepan a hole out of the back of the ukulele, directly opposite the bridge, that could locate the flange of the speaker. Another hole was necessary for fitting a 1/4" jack socket, in the side of the ukulele and, after soldering-up, this was introduced into the body through the speaker hole and pulled into position with the help of a length of flexible wire. The flange of telephone speaker was then glued to the body, magnet facing in, to give a fairly inobtrusive addition to the instrument. 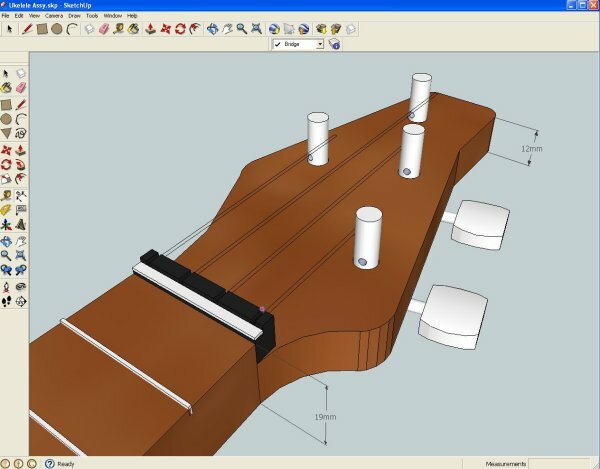 I hope that you have found the information on this website useful and, if you haven't started already, you are all fired up to have a go at making your own ukulele.